Bombardier today announced the latest addition to its expanding Services and Support network – a line maintenance station (LMS) located at Le Bourget Airport near Paris, France. The new facility is the seventh line maintenance station to be opened in the past 18 months, further strengthening Bombardier's OEM support services offering for its growing European customer base. In addition to standard scheduled line maintenance and unscheduled and AOG maintenance support, the new facility offers both wheel and battery shop maintenance services. The technical engineers supporting the facility are certified for the Learjet 60, all Challenger 300 series, all Challenger 600 series, and Global series business jets, including Bombardier's flagship Global 7500 aircraft. This month, Bombardier also expanded its North American Mobile Response Team (MRT) by adding five new trucks, bringing the worldwide total to 30 and enhancing the MRT's reach and response times. Based in San Francisco and Santa Ana, CA, Las Vegas, NV, West Palm Beach, FL, and Scottsdale, AZ, the strategically-located MRT trucks will enhance the delivery of parts and technical support across the U.S.
"With these investments, we are adding expertise and increasing accessibility to OEM support for our European and North American operators," said Jean-Christophe Gallagher, Vice President and General Manager, Customer Experience, Bombardier Business Aircraft. "Our new line maintenance station will enhance the customer experience by offering our European operators maintenance options closer to home, while the addition of five new trucks will augment the North American efforts of our MRT, already ranked as one of the most comprehensive onsite, mobile and aircraft-on-ground resolution services in the industry." Line maintenance stations in Europe: The newest facility brings the total number of Bombardier line maintenance stations in Europe to seven. Existing line maintenance stations are located in London Luton, UK, Linz, Austria, Nice and Cannes, France, and Milan and Olbia, Italy, complementing the tip-to-tail heavy maintenance services provided by Bombardier's newest service centre at London Biggin Hill Airport. Bombardier operators also have access to 11 Authorized Service Facilities in the region. 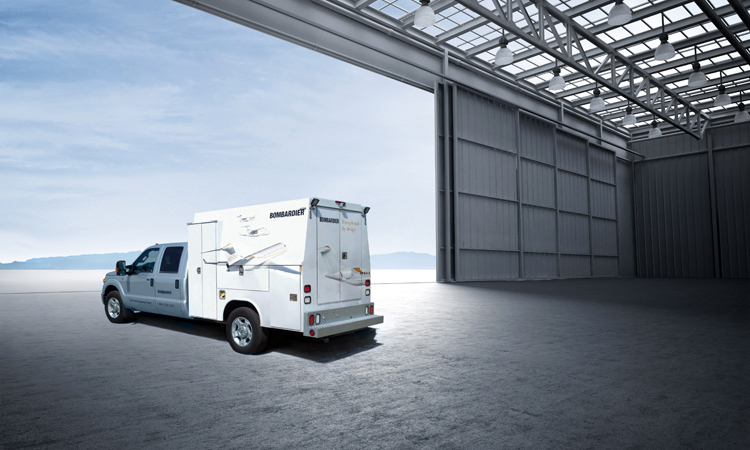 Worldwide Mobile Response Services: In recent months, Bombardier has significantly expanded its customer response capability. The Mobile Response Team network boasts 30 ground vehicles worldwide in addition to an MRT aircraft, which deftly supplements the shipping of parts out of Bombardier's main North American parts distribution hub at Chicago O'Hare International Airport. Bombardier has established two maintenance control centres (MCCs) in Wichita, KS and Linz, Austria. The new MCCs work in conjunction with Bombardier's Customer Response Centre, which operates 24/7 to streamline customer requests and optimize maintenance support.